Fairly similar, wouldn't you say? Player A has a little more power, but less speed and patience, and therefore scores fewer runs, though they both drive in about the same number. Players A and B both play for pretty good offensive teams, and hit near the tops of their respective lineups. Both players have hit over .300 for their careers though both just had a fairly down offensive year for them. Both play the left side of the infield, and both have won Gold Gloves as shortstops, though by most modern analysis, neither is very good on defense. Both players hold their franchise's all-time career records for at-bats and hits, and are on the top-10 lists for a bunch of other counting stats. The Gold Glove remark probably gave me away, though the stats never would, in themselves. Player A is Mike Young and Player B is Derek Jeter, but the stats shown are compilations of their road splits for the last three seasons, prorated to look like one year. Though there are some differences, you could hardly find two more seemingly similarly players overall, especially given their defensive positions, abilities, and their iconic statuses to their respective franchises. I recently read an article in which Mike Young's road stats were used as evidence that he can't really hit anymore, and that his home ballpark is really the only reason he finishes each season with respectable looking traditional stats. This seemed like a curious way of going about things - i.e. completely ignoring half of a man's games for three whole seasons - and it made me wonder whether Jeter might show a similar effect, especially given the reputation that New Yankee Stadium received for boosting offense early last year. As you can see from the first line of stats above, those numbers are really nothing special, about what Howie Kendrick or Cody Ross hit last season overall, an eminently forgettable performance. Add to this the fact that he's already in his mid-30's, he's a terrible fielder (whether you prefer fielding percentage and Range Factor or more modern stats like FanGraphs UZR/150, Baseball Prospectus' Fielding Runs, and Bill James and John Dewan's +/-), and you can see why the Rangers felt the need to sign a free agent third baseman. And Young's trade request, for all the team's official posturing about wanting to move forward with their plan of having Young DH most of the time, was probably welcome news to Nolan Ryan and the Texas front office. Why wouldn't they want to unload an aging, sub-par defender whose offence had slipped to the point of being barely passable, but who still looks respectable only because of his home park? Why would they want to pay another $48 million over the next three seasons for him? Jeter's line, as I mentioned, is better, but not a lot better. He gets a few more hits, takes a few more walks, steals more bases, but that's about it. He has less power, is two and a half years older than Young, and plays an even tougher defensive position. He's not much good on defense either, according to most modern metrics, though he does well in fielding percentage presumably because his poor range limits his opportunities to Knoblauch a ball into the stands. So why, given their similarities, would the Rangers be looking to limit the exposure of Michael Young as much as possible while the Yankees were willing to give a guaranteed $51 million new contract to Jeter? What are we missing? *Though not always. 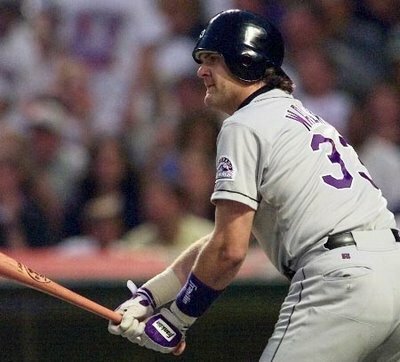 While crunching numbers for this, I discovered that Larry Walker had hit .280/.383/.514 in his time in Colorado, spanning nine and a half years, and that after leaving, he proceeded to hit .286/.387/.520 as a Cardinal over the next year and a half. Not that this constitutes a "poor" performance by any stretch, only one that was amazingly consistent with his road splits. Usually it's not this easy. Most players end up somewhere between their road and home numbers, though generally closer to the road ones. Rob Neyer once referred to this as a "polar bear effect", wherein Rockies hitters essentially wind up adapting to Coors Field so well - like a polar bear, uniquely adept at thriving in one particular environment - that they're no longer all that good at hitting at lower altitudes. The difference is that hitters seem to re-adapt to sea level when they get back there, eventually. Arlington is not so severe a hitter's environment as Coors Field, but maybe there's a similar effect. Maybe opposing pitchers wilt in the Texas Summer heat but find their groove when they get back home? Additionally, if the discussion in the new book Scorecasting is to be believed, everyone hits better at home. The umpires, whether they know it or not, are on Mike Young's side when he's in Texas, giving him fewer called strikes, more called balls, more benefits of the doubt on safe/out calls, and etc. Virtually every year, the major leagues as a whole hit about 30-40 OPS points better at home than on the road, almost entirely for this reason, so why should Michael Young be any different? None of this is to say that the Jeter contract was a good idea, or that performance statistics should be the only deciding factor in whether or not a player gets re-signed (and for how much), only that it can sometimes be interesting and/or instructive to compare players who have similar - if slightly hidden - resumes. Generally speaking I think the Yankees will end up regretting this contract by the time it's half over. Shortstops simply don't tend to remain shortstops when they get to be nearly 40 years old, even great ones like Cal Ripken, and certainly not mediocre (at best) defensive shortstops like Jeter. Except that the Yankees don't have any place else to put him. They're not going to make Jeter a third baseman, as Texas did with young when Elvis Andrus was promoted. Alex Rodriguez is over there and is signed through 2017. They're not going to move Jeter to first, where Mark Teixeira is signed through 2016. And unlike Texas, New York has a serviceable DH, their former catcher, Jorge Posada, who's signed through 2011 and making a shade over $13 million. They may be thinking that they'll have to cut Jorge loose after 2011, especially if his offense dips any further. His OPS has already fallen in each of his last two full seasons from a high of 970 in 2007 down to 811 last year. He'll be 39 this season and won't be adding much to the team if he hits any worse than he did in 2010. American League designated hitters averaged .252/.332/.425 last year, while Jorge hit .248/.357/.454, only marginally above average. Jorge's retirement or departure as a free agent would enable them to slot Jeter in as a DH for the remaining two years (three if he exercises the 2014 player option) of his contract. Of course, that too would require some improvement. As a shortstop, Jeter's 710 OPS in 2010 was still a tick or two above the AL average (669) but it would be well below the 758 OPS that Junior Circuit Designated Hitters average. If he can perform at something closer to his career level of 837, it could work, and that's not necessarily impossible. He hit only .307 when he put the ball in play last year, well below his career average of about .356, so if that was just a fluke and not an indication of declining skill, we should see a significant bounce in his batting average and therefore in all his other numbers. Baseball Prospectus has him pegged to hit .282/.348/.386 while Bill James is a little more optimistic, projecting .295/.365/.410. Tom Tango's Marcel system splits the difference: .283/.350/.397, shading to the cautious side. Those are all somehow based on the averages of players' performances who were similar to Jeter at a similar stage in their careers, but then Jeter is nothing if not unique, or at least, atypical. Two years ago he nailed his PECOTA projection almost exactly, hitting .300/.363/.408 when his projection said .297/.365/.407, but then in 2009 he blew his projection (.288/.353/.383, six homers) out of the water with a sterling season, hitting .334 with 18 homers and 30 steals. 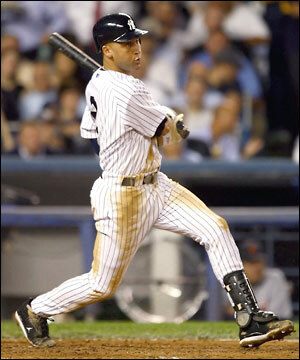 Would any of us really be all that surprised if Jeter hit .315 this year with 15 homers? Not really. His Clutchness has spent the better part of the last two decades surprising us. Of course if the Yankees to slot Jeter into the DH spot, they'll then need a shortstop, but that's a problem for next winter.